To have a truly reliable computer, you might want to manufacture your own high quality ribbon cables. This document will teach you how to make your own ribbon cables to connect your hard disks, CDROMs (Compact Disc Read Only Memories) and floppy disks to the controller. It will also try to persuade you that doing so is a Good Thing™. I will be using non-technical language. I presume those who need learn this skill would be frightened off by a technical discussion. I also presume those who know the technical language also know how to make cables already. I hope this will be simple enough that anyone can now make their own cables. Most clones use prefabricated grey ribbon cables from Taiwan. These are of low quality. I find cables are to blame in a surprisingly high percentage of supposed disk failures. Cables available since 2000 are somewhat better quality than the ones that were available when I originally wrote this essay back in 1991. However, for those wanting to build trouble-free cables to last a decade without failures, here is how. Poor quality contacts tarnish and you get intermittent hard disk and floppy errors. Cables do not flex well and kink when forced around corners. You get temperature sensitive intermittent floppy errors as wires make and break contact. The contacts have weak springs in them. The cables gradually wiggle off, especially when you transport your computer in a car. If you service your computer, each time to remove and restore the cables, the springs get weaker still. The cables usually are longer than necessary. The excess cable retards air flow, messes up the innards and acts as an antenna attracting noise to interfere with the delicate signals traveling from your disks to your controller. This was more of a problem with the old analog MFM (Modified Frequency Modulation) and RLL (Run Length Limited) signals, but as SCSI (Small Computer System Interface) and EIDE (Extended Integrated Drive Electronics) get faster and faster, it becomes crucial for their digital signals too. The cables sometimes are too short. This limits your slot choice or means straining the cables — which mean they will eventually pull off. The cables have many 180 degree twists in them to allow for the way the various devices are mounted. These twists eventually kink the cables. The twists are unnecessary when you custom-design your cables. Unnecessary twists also block air flow. Your disk fails. You buy a new one. However, your old one would have worked just fine had you cleaned the contacts and installed new cables. Make your own ribbon cables with high quality flexible ribbon cable, using American-made gold-plated connectors with super strong springs. Treat the contacts with Stabilant — a semi-conductor gel that bridges any small gaps at the contact. Exacto knife — a handle that holds a rigid razor blade like knife. a vice. I have heard rumour you can close the connectors with a mallet, but that is not my style. A vice with wide grips is best since it makes it easier to put the connector in the vice without the attached cable banging into the vice supports. I bought a crimping tool for about $50, which makes the job very easy. A small block of wood to act as a cutting board. If you start making many cables, you will soon find this manual method too time consuming. You will also find you often spoil cables by not aligning properly before crimping down. You might want to get a proper crimping tool. The tool has grooves to hold the wires at the correct spacing in the correct position. It also allows you to crimp, squeezing evenly over the entire length of the connector, while still holding the wires in alignment. There are three kinds of crimping tool: hand held, bench mount and powered. The hand held unit is cheapest. You can take it with you to a jobsite. The bench mount has a lever to pull to crimp. This takes less strength. Because it is mounted, it is also easier to work with. The power models are for cable factories. The problem is every manufacturer of connectors makes them a slightly different size. If for example you use an AMP crimping tool on Robinson Nugent connectors, it will just crumple them. You need a special die for each brand and size of connector. AMP, of course, does not sell any dies, except for AMP connectors. Conversely if you used AMP connectors in Robinson Nugent dies, they would flop around and you would not get good alignment. Before you buy a crimping tool, make sure dies are available for all the connectors you plan to use. When you budget in all the dies, the costs can be rather disconcerting. Sometimes your favourite brand of connector may be out of stock. If you don’t have a die for the replacement, you are in trouble. I like 3M brand or Amphenol Spectra Strip (discontinued?) ribbon cable. It is rainbow coloured which I find makes it much easier to use, especially when it comes time to count the conductors to make twisted floppy cables. When they are all grey, my eyes just give up. The conductors are tinned copper. The tin helps prevent the copper from tarnishing. Because Spectra Strip is thicker, you need connectors with sharper teeth to puncture the insulation. If your cables don’t work, it may be that the connector teeth are not sharp enough. Those sorts of generic connectors only work on the thin grey cables. For SCSI you will need a single 50-conductor cable with multiple drops. For wide SCSI (SCSI-3) you will need a single 68-conductor cable. SCSI will let you attach up to 7 devices on a single cable, including hard disks, CDROM (Compact Disc Read Only Memory) s, scanners and tape backup units. For external SCSI devices, you are best to buy pre-made round cables. Unfortunately with external SCSI devices, there are three common different types of connector. You must daisy chain from device to device with a separate cable ensuring each leg has the needed connectors on each end. These cables are horrendously expensive so make sure you get the right kinds and lengths. For EIDE or IDE (Integrated Drive Electronics), you will need a single 40-conductor cable. These let you attach hard disks and CD-ROM (Compact Disc — Read Only Memory)s. You can attach two devices (master and slave) to the primary channel. In machines with a secondary channel, you can attach a second master/slave pair of devices on a separate cable. For an MFM, RLL or ESDI (Enhanced Small-Device Interface) system, (now obsolete), you will usually be building three cables. You need some 34 conductor cable (for the floppy cable and the wide hard disk cable) and some 20 conductor cable for the narrow hard disk cable. If you are buying just enough for one set of cables, buy three times too much to give yourself a chance to goof up. By Murphy’s law you will get it right the first time. However, if you follow my advice about paper mockups you have a good chance of making it on your first try. Buy plain flat cable. The braided stuff will be harder to handle. Take a sample set of cables with you when you go to buy the parts. 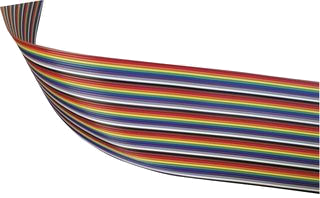 It is quite legit to just point and say — I want some of that only in rainbow colours and more flexible. I have not seen this product for sale. If anyone knows of something like this, please let me know. It consists of pairs of tiny coloured dots. They would come in a package containing a wide selection of bright rainbow colours. You need to be able to find a pair in a colour to contrast with any background. You could use them in pairs if there were not sufficient unique colours for a given job. They might be made of plastic, vinyl, glass, ceramic or special type of paint with high surface tension that pulled itself into a perfectly round blob. You could stick them to any surface including metal or vinyl, perhaps using a dot of special glue. They must not come off with water, alcohol or common solvents. The Avery coloured dots you get an a stationery store come off far too easily. They are designed to stick only to paper. You want them to look neat, as though they were part of the original equipment. You don’t want a crude slash of nail polish. They need to stick to both flat and curved surfaces. You would use them for example to mark pin 1 of a connector and pin 1 of a socket. You can mindlessly match them up to reconnect a computer getting all the connectors in the right place right way up. They could be used for external cables as well. They could also be used on stereo equipment or anything else with multiple cables. Since manufacturers won’t shape-colour code connectors for economic reasons and since sometimes connectors don’t have a dedicated purpose, this is the next best thing. If you are a company considering producing such a product, you could also sell it as a child’s toy, something to decorate toys or other objects, though the child’s toy version probably should have a non-permanent adhesive. To buy ribbon cables and connectors, look up Electronic Supplier in your local Yellow Pages. You won’t find these at your local Radio Shack. In California you might try Fry’s Electronics. I like 3M brand or Amphenol Spectra Strip ribbon cable. I have had success with Amphenol and RN (Robinson Nugent) brand. You want ones with some gold plate — that is the reason we are going through this exercise — to get good contacts. AMP connectors have barbs on the teeth to prevent the wires from pulling out. Amphenol (no relation to AMP) has little release triggers to let you open up a connector. Remember, your crimping tool must match your connector brand. If you are buying large quantities, ask the manager for a deal. Adaptec. Adaptec makes high quality disk controllers, so their cables are probably also of good quality. CyberGuys they will give you a discount if you mention this website. I have not dealt with any of these companies, so I can’t vouch for quality of goods or services. Except for mounting telephone jacks, you don’t need a screwdriver to work with cables. However, I thought this might be as good a place as any to describe screwdrivers. The best ones are made of molybdenum steel that does not go mushy. Colour coded handles help select the right one from a giant pile. slot head Also known as flat blade. Used in AC (Alternating Current) electrical wiring and consumer products. Screw slot slips easily. Invented by nameless British carpenter in 1744. Phillips Commonly misspelled as Philips. Also known as cruciform. Used in computer cases and AC electrical wiring. Most common on smaller screw sizes. You will need both American and metric versions. Most common sizes are Ph0 to Ph3 with #0 being the smallest. Screw less likely to slip that slot head. Invented by American Henry F. Phillips in 1936. Posi-Drive aka PoziDrive. Used in ski equipment and on euro-hinges in cabinetry. Similar to Phillips. Comes in sizes Pz0 through Pz2. I don’t know the inventor. Robertson Also known as square-tip. Used in furniture and in Canada. Screw can be held firmly on the tip of a screwdriver. Most common an mid and larger screw sizes. You can put quite a bit of muscle on the screw without it slipping. 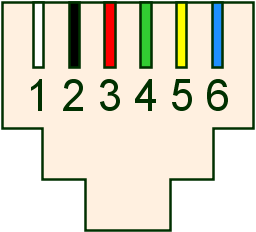 Handles are usually colour coded for size: yellow(#0), green(#1), red(#2), black(#3) and double black(#4), with the smallest being yellow(#0) and green(#1) and red(#2) being most common. Invented by Canadian Peter Lymburger Robertson in 1908. Torx 5 lobe Tamper-proof applications. Screwdriver sales of variant proprietary secure designs are restricted to registered equipment owners. Torx 6 lobe Tamper-proof applications. In Macintosh and Compaq computer cases and automotive. This keeps out the casual user. Typical sizes include T-8, T-9, T-10, T-15, T-20, T-25. Also used for various proprietary secure variants that restrict the sale of screwdrivers to registered equipment manufacturers. The actual lobes look more gear-like and less flower-like than my illustration. Allen key In furniture designed to be assembled by the customer and then disassembled later, especially that sold by Ikea. Works with an L-shaped wrench often included with the furniture. You will need both American and metric versions. Invented by American G.F. Heublein, the same man who invented the premixed cocktail and the Graham cracker. Socket Wrench The driver is a female-ended tool to fit over a hex nut. These are often used to insert the pins into which you screw the connections for serial cable. The screws used in computer cases are usually designed to be driven either with a nutdriver or with a Phillips screwdriver. I don’t know the inventor. I printed out the icons above for each screwdriver type and used them to label the containers I keep my screwdrivers in. For an A: B: floppy cable, you will also need two 34-pin edge connectors and one 34-pin pin-type connector. For a CK-17 type cable that gives A: B: and mag tape, you need a third 34-pin edge connector. For SCSI you need an 50-pin female connector for the controller and one for each drop off device. One cable snakes through all the devices. Wide SCSI is the same, except you use 68-pin connectors. For IDE and EIDE you need a 40-pin female pin-type connector for the controller and one for the master and one for the optional slave device. There is only one cable. For an old MFM hard disk cable you need a 34-pin pin-type connector and one 34-pin female edge connector for the wide cable. You need a 20-pin pin-type connector and one 20-pin female edge connector for the narrow cable. Look at the connectors on the controller and the disk if this is unclear. If you want to support two old MFM hard drives, you will need two 34-pin edge connectors and one 34-pin female pin-type connector for the wide cable. You will need a total of two 20-pin edge connectors and two 20-pin female connectors to make the pair of narrow cables. Look at the connectors on the controller and the disk if this is unclear. I have had success with Amphenol and RN (Robinson Nugent) brand. You want ones with some gold plate — that is the reason we are going through this exercise — to get good contacts. AMP connectors have barbs on the teeth to prevent the wires from pulling out. Amphenol (no relation to AMP) has little release triggers to let you open up a connector. Your best bet is to take in a Taiwanese floppy cable to show the electronics clerk the sort of ribbon cable you want and the sort of connectors you want. There are hundreds of variants. So long as it looks mechanically the same dimensions, you are ok. Some people think strain relief is a good idea. You make the cable go through a few loops before exiting the connector so it cannot pull out. These are harder to make, are bulkier and might not fit in between boards. You have greater danger of kink damage. Since there are no forces pulling inside the machine, I don’t use these myself, though other who probably know better than me have recommended them. The colours of the ribbon cable conductors follow the resistor colour code, except they start counting with 1 (brown) instead of 0 (black). A floppy cable has 34 conductors, so it starts with brown for pin 1 grey, white, black, brown, red… repeating itself and ending on yellow. (See the figure near the end of this document.) The narrow hard disk cable has only 20 conductors so it starts at brown for pin 1 bought cheap cable, it will all be grey, except pin 1 stripe. It is best to start with a machine with cables already installed. Before you remove them, note very carefully how they were attached. You can use these old cables as models for making new improved ones. Brown is pin 1 It is very important that the brown conductor goes to pin 1 on the controller card, pin 1 on the hard disk connector and pin 1 on the floppy connector. How do you tell which is pin 1? It might even be marked! There might be a dot near it. There might be a notch bitten out near it. There might be a pin broken off near it. The manual might tell you which one it is. The solder pad on pin 1 is often square rather than round. You might have to look on both sides of the board on which the pin is mounted for the square solder pad. Pin 1 might not be marked, but pin 2 might be. it is safe bet that pin 1 is right next to it. When you find pin 1, mark it with a red Sharpie fine tip permanent marker (not on the contact itself, however!). I repeat, every time you find pin 1 mark it. Whiteout for correcting typing errors comes in a pen. Whiteout is good for marking on dark surfaces where the Sharpie does not show up well. Why mark? The first time you attach a pin, you will be very careful and will get it right. The fifth time, you will be careless and will get it wrong. If you put a dot on the cable and a matching dot on the connector, you are much less likely to make a mistake when you get sloppy. Let us start with the narrow hard disk cable — the simplest. Lay a piece of cable out in front of you (don’t cut it yet) with the brown pin-1 strip a way from you. Imagine we are going to attach the pin connector to the controller on the left hand end. There are four ways you can attach it. Two have the connector pin holes down, two up. You can attach it right side up or upside down. Strangely, all four ways could work, but there are two confusing ways and one best way. If you look closely at the connector, it may have pin 1 It is almost symmetrical, so the choice is in a sense arbitrary. It may be a dot, or a small 1. You want to make sure that pin 1 the cable. Otherwise, someone who does not know that brown=pin1 might read the number and hook the cable up incorrectly. When you find pin 1 red dot. Ok, that rules out two possibilities and leaves two. Even with pin 1 the brown, you can still have the connector pin holes facing up or down. This is why you draped your cable. One way will let the cable drape naturally. The other will create a 180 degree loop. I prefer natural drape since the cables take less room, kink less and interfere with air flow the least. Be consistent. Have all cables flow in the same direction away from the controller. Have both cables flow either up or down from the hard disk. Now repeat the planning for your edge connector that attaches to the hard disk. You can have the cable flow out the top or bottom of the disk and still have pin 1 remove hard disk cables in tight quarters if they flow out the top of the disk(s)/CDROM(s). In a tower or mini-tower case, usually it is easier to drape the cables out the bottom of the hard disk(s)/CDROM(s). Make a mockup of your new cable with paper or using an old Taiwanese cable, showing where you would reverse and where you would leave connectors the same. Adding machine tape is good for making long cable mockups. Attach the connectors to the paper mockup cable with Scotch tape, (mounting firmly and realistically on both sides of the connector) and mount it inside the computer to ensure all connectors will fit as planned. (Be especially careful with the hump key on IDE connectors. Similarly, Compaq floppies require the hump to be on top.) Tape the connectors with their connections pointing out so they could actually be test pressed against the pins they need to connect to. Edge connectors are numbered underneath. Make sure you have them the right way round so pin 1 of the connector aligns with pin 1 of the ribbon cable. Apply the Scotch tape to each side of the connector to brace it in position. It is best to make all the mockup cables before making any real ones. This way you can see how the mockups drape and interfere with each other. You may discover you need to add extra twists to get the cables to nestle nicely. When you go to make your real cable, follow your mockup precisely. Do not add an extra half inch, or make any other last minute adjustments. If you make any changes you will discover such innocent changes usually have some undesirable side effect. If you want to make a last minute change, change the mockup and re-test the mockup. Make sure you also simulate floppy cable twists in your mockup. Also paint a stripe down your paper cable visible from both sides to represent the brown pin 1 conductor. Some pin connectors come with an extra cap. The idea is you loop the cable back 180 degrees, then put the cap on. This provides extra strain relief. In your cable planning, it adds a complication, since cables with strain relief flow in the opposite direction from normal cables. If you have trouble with choosing your cable lengths, ask Goldilocks to help. If you make them too long, they tangle, impede air flow, kink and look messy. Part of the reason for this whole exercise was to shorten the cables to reduce the antenna effect, so don’t blow it with whang dang doodle cables. IDE and RLL cables especially should be kept as short as possible. Ironically, SCSI cables sometimes also have trouble if they are too short. If you use strain relief, you have to allow a little extra for the curls at each end. If you make them too short, they won’t reach and you have to make new ones. Also you have no flexibility to move things around a little. So, to start, err on the long side. As you gain experience, you can cut the tolerances tighter. I find one way to judge is to mount the controller card one slot too far away. Build your mockups without excess slack. Then when you move the card to its proper place, you will have a little extra slack. This slack can be useful if you goof your first cut. You can shave the end off the cable and try one more time. The cable will still be long enough. Use the triangle to mark a right angle across the cable. Score it with the Exacto knife. You can then repeat the scoring till it cuts through. I find repeated scorings work better than one big one since it stretches the cable out of square less. Or you can finish the job with scissors. Try both ways to see which gives a cleaner, squarer cut. It will depend on your tools and your mechanical skills. Examine your cut to ensure there are no fine wire hairs poking out. These could cause shorts if they are not cleanly removed. Try a fresh blade if you cannot get clean square cuts. Lay out your paper model and the cable side by side, with pin 1 you. Start from the controller end. If you have enough connectors, leave your paper model intact. If you don’t, peel them off one at a time to attach to your real cable. As you peel them off, make sure you have noted on your paper cable their orientation and position. Then thread the cable through the pin connector on one end. Triple check that you have threaded it in the way you planned. You have only one chance in four of getting it right if you just do it randomly. You will see two rows of teeth. The wires slide between the teeth like 34 little pieces of dental floss. There are a pair of teeth reserved for each wire. You have to get each wire paired up with the correct set of teeth. This is much easier than it sounds. Align the cable, check both the front and back row of teeth for perfect alignment. Especially check the two outside conductors on each side. If you get them right, the rest take care of themselves. If you find alignment is impossible, try stretching the cable a little to spread the outside two conductors a little further apart. You want to stretch the cable evenly, so start at the centre and work outwards with both thumbs. If you simply tug at the edges, all the stretching will occur at the edges with little in the middle. Get out your triangle and make sure the connector is perfectly square with the cable. Now gently squeeze the connector shut. A bar will force the wires into the crevices between the teeth. They won’t go in, unless your name is Clark Kent. Now gingerly put the thing in a vice, never letting go. Keep watching to make sure it is still square. Use the vice to squeeze one end a little, then without letting off the pressure squeeze the other end a little. If all is still square you can manipulate the whole thing in the vice at once. This is very hard to do without the preliminary mini-squeezes on the ends. Screw down, holding the cable out the way so you can watch the wires being tortured and impaled on the teeth. When they are fully down, you might hear a tiny click as the connector locks. Don’t squeeze further, or you will just crack the connector. Remove it from the vice and study both sides. It should still be square and all the teeth should be attacking the correct wire. The teeth have sharp sides that bite through the insulation of the wires. With some pin connectors, it is easy to pop to top off to examine your handiwork inside the connector. Ensure each wire is skewered onto the correct pair of teeth. You can use a small screwdriver, the way a dentist would scale tartar from teeth, to press the wires fully down onto the teeth. Then replace the cap. If you were very careful inserting the cable in the connector, there will be no cable poking out the other side and there will be a perfectly smooth end. However, the stub should poke out enough to clear the teeth. What if your cable has a ragged end poking out? Just use your Exacto knife to pare it off. Be very careful. Connectors have a nasty habit of suddenly twisting in your hand and you stab yourself with the Exacto knife. (How do I know these things?) When you are done make sure there are no fine wires poking out. They could short with nearby conductors. Shave them off cleanly. Recheck your cables with your plan. If some connectors are not on squarely, start over. Unfortunately, recycling the connectors is often very difficult. Some connectors can be opened by poking paper clips into little holes on the bottom and prying. Others can be opened with a small screwdriver. Peel the cable off the teeth very gently, or else you will yank the teeth out. Compare your cables with known working cables. Study them for signs of malocclusion. Now try them out. Your cables will not be keyed, so it is quite possible to put them on upside down. Make sure all power is off when adjusting or changing cables. Make sure the brown conductor goes to pin 1 sure you have attached each pin connector squarely — not off by one row or column of pins. Use a flashlight to make sure. The wide hard drive cable visits both hard drives if you have two. C: is on the end. The wide floppy cable visits both floppy drives with A: on the end. There is a separate narrow cable for each hard drive. Edge connectors are not used much on modern machines. I always start with the pin connectors instead of the edge connectors because they are cheaper. In learning, I like to destroy cheap stuff first. Again, triple check your design with your plan before you start squeezing. If you do it randomly, you have only one chance in 16 of getting a two-connector cable right. Unless you have two ancient MFM physical hard drives, C: and D:, you can skip this section. If you have one drive, split into C: and D: partitions, you can also skip this section. However, if you have two physical drives, you have to read this confusing section. For an old MFM hard disk cable you need a 34-pin edge connector and one 34-pin connector for the wide cable. You need a 20-pin edge connector and a 20-pin connector for the narrow cable. If you want to support two old MFM hard drives, you will need two 34-pin edge connectors and one 34-pin female connector for the wide cable. You need a total of two 20-pin edge connectors and two 20-pin female pin-type connectors to make the pair of narrow cables. edge connector for D: drive in the middle of the cable. edge connector for the C: drive on the end of the cable. If you installed the C: connector first, you would find you could not thread the D: connector on it because the C: connector would block you. If you use two hard drives, strap your C: drive as Ds0 and your D: drive as Ds1. Unfortunately some disk manufacturers start counting at 1. If you have one of those drives, use Ds1 and Ds2 respectively instead. If you use two hard drives, put a terminating resistor in your C: drive (the default) but remove it from your D: drive. Note this hard drive cable for dual drives has no twists in the conductors. My untwisted scheme avoids those monstrosities. However, there are many ways to skin a hawk. There exist variants with C: and D: reversed and twisted cables. I believe the method I have shown here is the most reliable and straightforward. IDE disk drives use a single 40-conductor ribbon cable with female 40-pin connectors on each end. If you have dual drives, both drives hang off the same cable without twists. Making an IDE cable is very much like making an untwisted 34-conductor MFM hard drive cable. Pin 20 is the key. It will be missing a pin. Right above pin 19 will be a notch where a hump in the cable connector fits. As usual, the brown stripe of the rainbow cable goes to pin 1. On the IDE adapter stub, pin 1 keyed, but you still have to get the brown stripe on pin 1. When you make your cable you must make sure the hump on the side of the connector is oriented as above, with the hump above pin 19. If you fail to do this and get the hump on the wrong side and use the cable upside down, you will get an intermittent connection. Your drive will just freeze up from time to time. Usually pin 1 is in the centre of the drive. You may come across some baffling ATA (Advanced Technology Attachment) cables that appear to have 80 conductors. 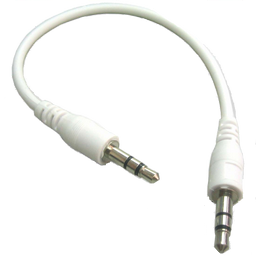 The connection on the drive end of the cable is standard. However, the connector in the middle is cross wired so that a disk strapped as master connected there appear as a slave to the controller. This similar to the more obvious twist in floppy cables. The idea is to make installing disks more idiot proof. However, if you aren’t familiar with the cables, you will be startled to see your master disk showing up a slave. SCSI disk drives use a single 50-conductor ribbon cable with female 50-pin connectors on each end. Wide SCSI is the same with a 68-conductor ribbon cable. If you have dual drives, both drives hang off the same cable without twists. Making an SCSI cable is very much like making an 40-conductor IDE hard drive cable. When you make your cable you must make sure the hump on the side of the connector is oriented as above, with the hump above pin 25 this and get the hump on the wrong side and use the cable upside down, you will get an intermittent connection. Your drive will just freeze up from time to time. I have saved the worst for last. These wretched floppy cables have a deliberate twist inside the cable! I worked all night once trying to find a way to avoid this ugly, reliability-wrecking twist, but finally convinced myself that IBM (International Business Machines) has meddled with Shugart’s design of the floppy disk controller interface so badly, it was not feasible. The twist requires some manual dexterity to master. You can make new hard drive cables and leave your floppy drive cable as its crummy old original if this daunts you too much. The rationalisation for it is the twist means you don’t have to set the drive select jumper on your B: drive, just remove the terminating resistors. Prepare the pin end connector to the controller and the middle B: floppy drive edge connector just as you would a dual hard disk cable. (Oh, well you did have to read it anyway.) We have to then introduce a twist between the B: and A: connectors. black 10 16 Twist this block of 7 upside down. I suggest you study a working floppy cable to see how this works. 3D effects are difficult to show in plain HTML (Hypertext Markup Language). Attach the connectors in this order: controller, B: then A:. If you do the A: first, you won’t be able to slide the B: connector on. Before making the split, check if the cable is going to need a gentle stretch to spread it to fit. If so the time to stretch is before you make the cuts for the split. Hooking up the final A: connector is tricky. You have three flaps of cable to thread and align. You also have the twist fighting you. It wants to drag the middle tongue out of alignment. Since the middle flap has a twist, it is a tad shorter than the outside flaps. So in your aligning, let the outer flaps poke out more. You can trim them all off neatly later. Be ultra careful that all three flaps are perfectly square and all conductors are meshing with the right teeth. It might help to borrow someone’s extra pair of hands for this tricky task. Another trick is to Scotch tape all three flaps together before you try to thread them through the connector. When you buy an AT (Advanced Technology) motherboard, it will come with some narrow 10-conductor ribbon cables to attach the motherboard to 9-pin or 25-pin serial port connectors on the back of the case. There are at least two styles of these cables and they look identical. Your best bet is to always use the cables that came with the motherboard. If you have to make replacements, here are the two most common types, called Pin-To-Pin and X-Cross. You can figure out which type of cable you have with an ohmmeter. There is no easy way to determine which kind of motherboard you have other than by experimenting with both types of cable. Typically which type of cable your motherboard requires is not documented. When you buy an AT motherboard, it will come with some 25-conductor ribbon cables to attach the motherboard to parallel port connectors on the back of the case. There are at least two styles of these cables and they look identical. Your best bet is to always use the cables that came with the motherboard. If you have to make replacements, here are the two most common types, called Pin-To-Pin and X-Cross. You can figure out which type of cable you have with an ohmmeter. There is no easy way to determine which kind of motherboard you have other than by experimenting with both types of cable. Typically which type of cable your motherboard requires is not documented. To learn the details of how these various pins are used see Signal explanation. The wide MFM hard disk cable is only slightly tougher than the narrow one because there are 34 wires to impale between the teeth instead of 20. IDE cables at 40 conductors are a little more difficult. SCSI at 50 conductors and Wide SCSI at 68 require the most skill to do correctly. Start on narrow cables and work up. The wide cable and connectors are not only more expensive, it takes more skill to align perfectly. Floppy cables are hardest because of the twist. You can buy prefabricated cables in various lengths for Ten-Base-T Ethernet, so you don’t normally need to make your own. I have found pre-made Belkin cables in a variety of colours completely satisfactory. There are two kinds of cable: plain and cross-over. Crossover cables connect two computers back to back without a hub. They cross-connect receive (+/-) to transmit (+/-) and vice versa. Plain cables attach computers to a hub or router. Crossover cables are sometimes needed to attach an ADSL (Asymmetric Digital Subscriber Line technology) or cable modem to a hub or router. Uplink ports on a hub allow you to daisy chain hubs using a plain cable. David Charlap has been making his own Ethernet cables for several years now, not because he has any problem with store-bought cables, but because it costs so much less. Most problems getting Ethernet cables to work come from using the wrong kind of cable. When you buy cables, label them clearly so you won’t be baffled later, perhaps buying only plain cables with blue insulation and only cross-over cables with yellow. Happily SMC and NetGear routers are intelligent and adapt automatically if you use the wrong type of cable. The RJ-45 connector should be mounted with the bare contacts up and the spring locking hook down. This helps keep dust off the contacts. Pin 1 is on the left as you look at a female socket, or on the right if you look at a male-ended cable end-on. Why did the designers waste half the pins? The RJ-45 connector is bigger and more rugged than either of its smaller 6-conductor or 4-conductor cousins. Further it is less likely to be confused with a 4-conductor RJ-11 used by telephones. You might think it would have been simpler to use only two conductors as in 1000 Base-T, but then you need expensive logic for echo suppression. Wiring is costly to install. Those extra 4 conductors may come in handy in some future application. They are sufficient for another full-duplex Ethernet’s connection. According to David Charlap there is yet another reason. The center pins of RJ-11 and RJ-14 jacks are used to carry voice on single-line analog phones. It is possible to accidentally plug a phone into an RJ-45 jack. When this happens, you don’t want to run phone voltages into your Ethernet —you may damage it. It’s better to leave those wires unused. Usually you buy cables that are way too long. What do you do with the excess? Coil it. Don’t just dump it in a heap. If you get 90 degree or tighter bends you will damage the cables and degrade signal quality. Ethernet uses one of two different standards: T568A and T568B. The two are effectively the same, except for which colors go where. Just to keep you on your toes, there are also various RJ-45 standards used by various phone systems, both analog and digital. Make sure you use the right kind of cable. Flat phone-style cable is fine for voice and slow data (like RS-232) but it will not work for high-speed applications. 10M Ethernet can use Category-3 (CAT-3) cable. 100M and 1000M Ethernet require Category-5 (CAT-5) twisted- pair cable. 1000M Ethernet should work fine with CAT5, although some people prefer CAT-5e or CAT-6. Cut a clean end on the cable. Diagonal cutters are good for this. remove an inch or so of the outer insulation. You can use a pocket knife. Pierce the insulation and pull the knife towards the end of the cable. Once you have cut a slit, you can peel the insulation back, away from the conductors and cut it away with diagonal cutters. Inside, you will notice that the eight wires are twisted together in four pairs. This is critical. The reason these cables can carry high data rates without shielding is due to the twists. Don’t straighten them out any more than necessary when attaching the connectors. Using your RJ-45 connector as a guide, trim the conductors to the right length. The right length is such that when the conductors are in the connector (all the way at the contact-end), the outer insulation reaches far enough into the connector to be gripped by the strain relief. It’s a little hard to describe in a text file. Practice is the best way to learn this. If the leads are too long, the strain relief won’t grip the outer insulation. If the leads are too short, they won’t reach all the way to the end of the connector. 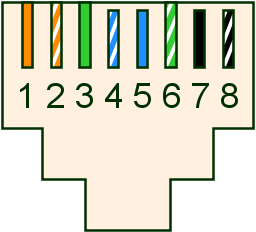 Once the wires are trimmed, untwist a small amount of the pairs and line them up in a row, according to the pattern you need for your application (for Ethernet, this is orange-stripe, orange, green-stripe, blue, blue-stripe, green, brown-stripe, brown.) It helps to straighten out the ends using a pliers. With the wires lines up in the right order, slide them into the connector. The connector has grooves for aligning the wires. The wires should go in easily. If they don’t, remove them, re-align them and re-straighten them if necessary. Then try again. If the insulation around the wires is too thick for the connector, then you have the wrong kind of wire. Some old-standard voice phone wire has insulation too thick for modular connectors. The wires should reach all the way to the very end of the connector. Once they’re in there, put the connector (with the cable) into your crimp tool, squeeze once and it’s done. Now inspect your work. All eight wires should still be at the back of the connector. The metal teeth should have all pressed themselves into the wires. The plastic strain relief should grip the outer insulation tightly. If it came out wrong, cut off your connector and start again. Test the cable. An untested cable is not complete. While professional test equipment (that can verify that your cable is able to pass data at its expected line-rate) can be expensive, a quick and dirty test involves simply connecting two devices (like a computer and an Ethernet hub) with the cable and moving some data across it. You can also test against you desired wiring pattern with a continuity metre across each pair. You might have to cook up a little jig using a pair of RJ-45 sockets to make it easy to get the probe on the desired conductor. To be thorough, you also have to test for shorts across all pairs that are not supposed to be connected. This is what an automated tester does for you. Telephones are wired with flat four-conductor cable. You attach plastic RJ-11 connectors to the ends with a crimping tools you can buy inexpensively at Radio Shack or Canadian Tire. The crimping tool also strips the outer insulation just the right amount. To make a connection, you strip a little of the beige outer insulation, insert the four wires into a plastic connector and crimp. The prongs in the connectors pierce the insulation of the wires and make contact. The connector could in theory contain 6 conductors, but the outer pair are not used. Telephones only need two wires to work. You will sometimes see just a red/green pair of conductors. In older homes you will see three conductors red/green/yellow with yellow delivering the party line ring. In modern homes you will typically see four wires. The second pair are used when a home has two outside lines. To get at the alternate pair, you must wire a jack to access them in the usual line 1 positions (pins 3 and 4), or you need a 4-wire, two-line phone. The RJ-11 connector should be mounted with the bare contacts up and the spring locking hook down. This helps keep dust off the contacts. 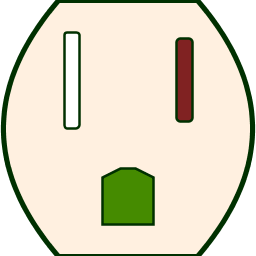 Pin 1 should be on the left as you look at a female wall socket, or on the right if you look at a male-ended cable end-on. And of on the left if you look at a male-connector from the side where the cable comes out. To make it easier to tell which side in pin 1 there is usually a ridge running down the underside of the outer insulating sheath. 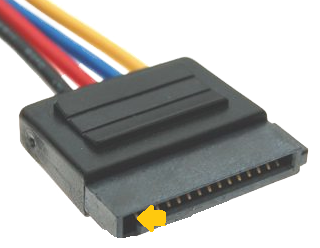 The RJ-11 connectors are transparent, so it is possible to tell if pin 2 has been connected to yellow or black by looking through the bottom of the connector. Tip and ring refer to the two parts of an operator’s cord-board plug-in the days of Alexander Graham Bell. You can remember this ancient terminology by thinking Red and Ring both begin with R and being in the red is having a negative bank balance. You will often find phone jacks wired with reverse polarity. You will also find wiring that flagrantly violates the colour code. Y This will cause unreliability and sometimes complete failure with some modems. You can test them with a voltmeter, or with a telephone tester from Radio Shack that just plugs into the RJ-11 outlet. Don’t try to poke your voltmeter probes directly into a socket. You will likely short them. You can make your own tester with a connector and a short piece of lead with the insulation stripped. It is a simple matter to correct the jack by reversing the screw-pole wiring inside. You will often seen two sets of wires (for two lines) going to the same outlet. Pay careful attention to how the existing wiring attaches to the white, yellow, green red, black and blue wires inside the existing phone jacks. The ringing voltage is 40 — 150 V RMS (Root Mean Square) AC, at 15.3 Hz (Hertz) to 68 Hz, superimposed on the normal DC voltage of 50 volts between tip and ring. You want to avoid shorting. Typically you work on phone cabling with live voltages. You need to watch out for these painful high ring voltages. Believe it or not, there was once an electrocution fatality from working on live phone lines. For safety, you can disconnect the parts of the circuit you are working on while you work on them and then connect them back to live voltages for polarity testing as you go. The typical connecting cable between the wall and a telephone has two males ends, one end wired with pin 2 it a cross-over cable. However, not to worry, all the telephones and modems of the world are wired backwards to expect this. Cross-over cables are easily constructed. Just apply a connector the same way up on each end of an untwisted piece of cable, using the bottom ridge to guide you. No individual wires need to be twisted. Just to keep you on your toes, some computer applications for RJ-11 connectors use straight through cables. To make one of these, apply one of the connectors to the other side of the cable. Making phone cables in pretty easy. About all you can do wrong is create a straight-through when you needed a crossover or vice-versa, or fail to center the 4 wires in the 6-slot connector. Beware, there is also a narrow 4-conductor connector used between telephones and handsets. These are not designed to fit into the usual 6-conductor wall sockets. At first glance you might confuse the two since they both typically carry 4 conductors. Mistakes are easy and cheap to correct. Just chop the end off the cable and try again. The crimping tool should come with diagrams and instructions on use. It is crucial you have a clean end cut. Any stray strands poking out could cause shorts. The crimping tool has a cutter. It should give you a nice clean square cut. If not, clean it up with some scissors. A plastic drawbridge in the connector is forced down and it digs into the cable insulation to keep if from pulling out. Little brass knives in the connector pierce the coloured wires to make contact. For these two things to happen, it is crucial that you remove exactly the right amount of outer insulation. You don’t remove any inner coloured insulation. The crimping tool will measure the amount accurately with its wire stripper. Don’t pull the insulation further back or forward over the conductors. If you strip the wrong amount of insulation, the drawbridge won’t be positioned correctly on the insulation. You want the wires to poke all the way into their slots. The connector is transparent, so peek under a strong light from all angles to make sure you have the wires all the way in, aligned with the little brass knives. After you have done a few, you can tell by feel when you have it right. Home crimping tools are rather delicate, so don’t squeeze down any harder than it takes to push the two arms together. The outer brass contact hooks on the connectors often break off, leaving a flaky contact. You can be a minor hero by replacing those connectors wherever you find them in the universe. Female RJ-11 connectors are not easily replaced. Usually they are soldered in place. The best you can do is clean the contacts — the wire springs. See my essay on contact cleaning/treating. You can use a foam swab or a toothpick soaked in isopropanol or DeoxIT to clean the contacts. They can get quite corroded and dusty. When you are done make sure you leave them nicely aligned. A bent one could cause a short. There is not much point in replacing all the male connectors and leaving the female ones filthy. RS232C cables are not usually constructed with ribbon cables since ribbon cables are not durable enough for use outside computer cases. Normally each wire is individually soldered to its connector. There are so many variants of serial cables, you pretty well have to construct them from first principles, wire by wire. See the essay More Than You Wanted To Know About RS232C. I have never heard of anyone making their own video cables. Normally they come with the monitor. 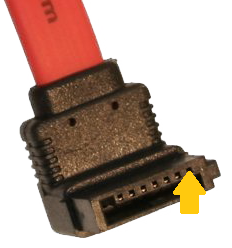 The most common type uses a 15-pin VGA (Video Graphics Adapter) connector. These are analog cables and hence need even more care constructing them than digital cables. The pins are fragile. Bent or broken pins will result in an off-colour or no picture. VGA cables often have magnets moulded into the cable near the ends or strapped to it to reduce noise. The connectors have three rows of pins in a D shape shell that plug into the back of the computer. The other end is usually hard wired into the monitor or attached via BNC (Bayonet Neill-Concelman connector) connectors. Here is what a male connector looks like pins facing toward you. 15 unused, formerly data clock. Mac monitors use 15 pin connectors too, but they scramble the pin order to encourage you to buy your monitors from Apple. blue line in, connect tape player etc. input.
. You can cook one up in a pinch by sacrificing two cables with microphone jacks on one end and something else on the other. The tip of the microphone jack has three sections, the sleeve (common), ring (audio signal), tip (push to talk). Each section must be connected by a wire to the corresponding section on the other end. You need to splice the three conductors in the middle. To get them right, use a continuity meter to see which wire is connected to which section of the plug. Most modern hard disks use a serial interface called SATA. It needs a large 15-pin power cable and a small 7-pin data cable. The connectors have a distinctive L shape notch to make sure you connect them on the right way up. I don’t know how you would make your own, so just buy premade cables. Pin 1 on the power cable is next to the notch. Pin 7 on the data is next to the notch. Here you must be more careful since the 120 V voltages can be lethal. Mistakes blow fuses and create great puffs of smoke. On the other hand the wires are large and easy to work with. There are only two or three conductors to concern yourself with and there are no such thing as crossover cables. What I am about to say applies only to Canada and the USA. Local wiring codes control the wiring and inspection of wiring in homes. CSA (Canadian Standards Association)/ UL (Underwriters Laboratories) must approve designs of any electrical appliance. You can take your computer to them for a test and a one-off approval. The larger left slot is neutral, the smaller right slot is hot. The central bottom hole is ground. Inside the box, neutral is wired to white, hot to black (rarely red), and ground to green or bare copper. Amateur astronomers might remember which slot is hot by recalling that small stars are usually hotter than large ones. 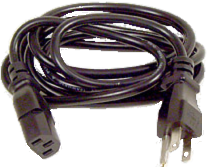 Some plugs have three prongs and can go in only one way. Some have two, with one prong wider than the other. They two can go in only one way. Some older plugs have two small prongs. They can go in either way. Lamp sockets are designed so the center contact is hot and the outer rim is neutral. This reduces shock hazard should you change a bulb with the power on. Switches should either make/break both hot and neutral or failing that make/break hot. It is unsafe to have a switch that make/breaks neutral only since then there are live voltages inside the device even when the power is switched off. Basically your job is just to keep connecting black to black, white to white and green to green. Hot is represented by brass colour and neutral by silver colour on screw posts in wall sockets and lamp sockets. Be careful to prune stray frays of wire least they touch and short. Using an AC voltmeter you can easily test that socket polarity is correct vis a vis hot/neutral, though I don’t know how you would easily detect crossed neutral/ground. That is less likely. You can get AC socket testers at hardware stores. The ground wire protects you this way. If for example a fault in a 3-wire toaster put live voltage on the case, since the case is attached to ground, it would short immediately and trip the circuit breaker, turning everything off before anyone got seriously hurt. Without a ground, the case could be live without tripping the circuit breaker. Life gets much more complicated wiring up a power supply to a switch. You are breaking the current both on the way in and the way out of your power supply. There you have four wires black, white, brown and blue. The switch acts like two switches, one to break the black to brown hot side and one to break the blue to white returning neutral side. Inside the machine, past the switch, brown is hot and blue is neutral. Breaking both hot and neutral helps protect you from idiots who wire up AC outlets backwards. You can test your switch with a continuity meter to figure out how it works. From that you can figure out which wire should go where. Think a long time and triple check. There are many ways to do it wrong that create a puff of smoke. Final hint. Never do work on AC wiring with anything plugged in, including power supply switches. It won’t take long before you have rat’s nest of cables, you can trip over, break a leg or yank your monitor off a desk. How can you keep them neat? When you make custom cables, making the just the right length does wonders. If the cable is too long, the slack will just get in the way. When you buy cables, purchase ones as close to ideal length as possible. At a home hardware store such as Rona, you can buy cable clamps, white nylon loops that screw into wood. You can thread cables through these loops. For phone cords, there is a miniature version, that look like tiny black or white m’s or u’s. You can buy Velcro straps to bundle cables together. These are expensive and come apart too easily. The advantage is they are easy to remove and reuse. At a home hardware store such as Rona, you can buy cable ties, what I call deer tags since they have a one way locking mechanism like deer hunting tag. They are made or hard white or black vinyl. They bundle cables together securely. The only way to get them off is to cut them with a box cutter. They are sometimes called multipurpose attachment ties. And there is Red Green’s beloved duct tape, not pretty, but it is versatile. Securely pin cables near the crucial end so that if somebody tugs on it, it won’t rip the pins out of your computer. Label all your cables, both ends. A black or red Sharpie fine tip permanent marker is very handy for this. If you want to get fancy, you can buy laser-printable cable labels. Get a low wattage fluorescent pig-tail gooseneck lamp and leave it under your desk. It will prove invaluable in solving cable problems, such as noticing a cable not properly seated or inserted in the wrong slot. Overly large connectors and overly fat cables. This caused cheaper, trimmer variant connectors and cables to evolve. Then the customer had to deal with mismatching connectors and various flaky gizmos to let them interconnect mismatching connectors. The new connector has to be as thin as possible right from the start. both physical and logical. There should be only one kind of cable end and one kind of device connector. It has to be idiot proof. When a faster scheme is evolved the tendency is to invent a new shape of connector. Then you can’t have a connector that handles slower legacy devices as well. Planning for evolution should be built into the original scheme, like film speed codes. Avoid delicate pins that bend or break. USB-style connectors are much more rugged. The connector is damaged or malfunctions when people try to insert the connector upside down. Ideally it should not matter which way you insert it or failing that, it should be be very obvious which way it goes from just a distant casual glance. Please, no subtle D whose curved side you need a flashlight to discern. Ethernet connectors dynamically decide what to use each pin for. Extend the idea to allow for future dynamic pin reassignment. Building your own cables sounds much more complicated than it is. You can do it much faster than I can describe it. Consider that I am one of the most mechanically inept people around. I made cables successfully all the time. I give so much detailed advice because I imagine I am talking with someone like myself with little mechanical intuition. Basically all you do is cut your cable squarely, thread the connectors squarely, and squeeze. I know longer have my cable workshop, so I can no longer build or repair cables for you.